Before you start or even when you’ve started the question of how long until you make money blogging is one of those questions that you want someone to give you a definite answer. It is similar to how much can I make. You see either or both a lot of times on Warriorplus sales threads. It is an understandable question and concern especially when you are about to spend money on a course – whether it a few dollars or a few hundred. Unfortunately it’s not a question that can be answered with any certainty. Each person is different. So, the answer given is it depends on you and the model and how you implement it. But, rather than leave it there I’m going to run through my experience with affiliate marketing and link to a couple of successful people’s posts to give an idea of what is possible year on year. What I’ve read online is that you need to be blogging for at least a year to see a proper income in from it. I think that is an at least from my experience with it being longer for a solid income to be earned. But much of that longer time frame is based on my experience. I tried a lot of different ways of making money that didn’t work out for me – some were bad ideas and some I didn’t follow through for long enough or there was something I just didn’t get. It wasn’t until I picked one method and stuck with it that I started to see some success. I stopped the hopping around from one shiny new object to the next and stayed with one thing – more or less – I did wander a few times. All that wandering did was slow me down. So in January 2014 I started my first Extreme Review style blog as part of a coaching course by Erica Stone. It is a review site of physical products with affiliate links back to Amazon for monetization. There is no email list or backlinking (other than social media promotion). It is based on your content being of a good enough value that people will read it as Google considers it worth of ranking high enough. So when did it make money? The first commission was earned was in July 2014 where it made $16 in commissions – which at least confirmed it could make money. At the time there were 26 posts published. Fast forward to April 2016 the commission earned was $245 with total posts of 86. Not the most impressive – it id peak in November 2015 at $296. Certainly not enough to qualify as earning a living. In January 2015 I started another blog along the same lines as the first but in a different niche. Things moved along a little quicker and more profitably with this one. The first month it made commission was March 2015 where it made $45 with 25 posts. In April 2016 it made $935 with 144 posts. It’s best month so far is $1799 in Jan 2016. So a much better result all round. With me knowing more and possibly a better niche for me to write about you can see the difference that can happen. I also have more posts published too. I believe that I’ve not done anything remarkable other than kept at it. People who can write better and understand the people in the niche they go into could probably get to $1k and above much quicker than me too follow this affiliate marketing model. Lesley Stevens who is one of the creators of Pajama Affiliates (one of my favorite set of courses for beginners and beyond) recently posted on her blog her earnings for April 2016. Before looking at that in detail for 3 months Oct – Dec 2015 her blog that is used for demonstrating the techniques for affiliate marketing in the courses made $100k in commissions. In April 2016 her affiliate marketing blog cleared $4,280.34 – 2.5 times last year and 8 times the year before. It takes time to earn an income from blogging but do it right and there can be big rewards from this, as you can see from the results in that one post. This was about writing quality content and learning as you go (she talks about a course that she has just implemented What Works Now that adding to her commissions – it’s a great course too for increasing the conversion rate). The other blog post which was shared in the Pajama Affiliates facebook group . This is about having patience when you write quality content. The author of the post is making $300 a month from a post he wrote last year. It has taken that long for it to start to rank on the first page. If you want to make money from blogging you have to take the time to write good valuable content and then be prepared to wait for it to rank – but it can be worth the wait. I know I’ve not given a definite time period for making money from blogging and affiliate marketing but it is different for each person and the niche they choose to blog about. The fastest way I know to be making money from blogging is to follow along a proven course by someone who has made it. It’s even better if you can see a successful blog and get to ask questions of the person that has made that success. 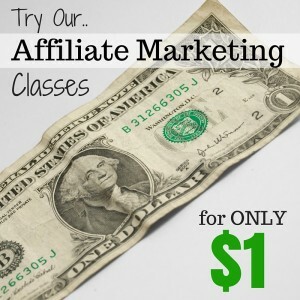 The Pajama Affiliates Home Blogging And Affiliate Marketing Course does a pretty good job at doing this for beginners – taking them through what is needed to create a successful blog in a step by step way. There is a facebook group where you can ask questions if you get stuck that it very active. 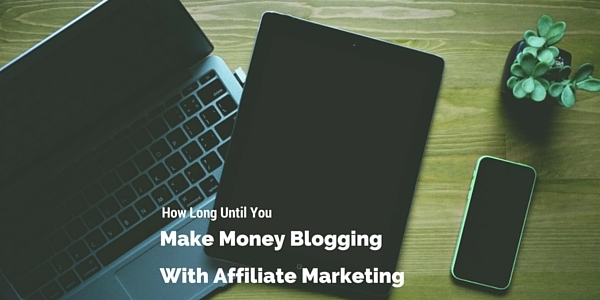 Over to you, is do you have a timeframe for making money from blogging?